SIZE: Small- to fit 32”-34”chest, Med.- to fit 36”-40” chest, Large- to fit 44”-46”chest. 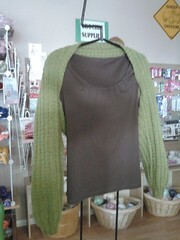 Note: To change the shrug size, use a larger needle after the cuff. Small size use 7mm, Med. Size use 8 or 9mm, large size use 10mm. MATERIALS: 450m (600m, 750m) of any smooth or textured yarn, light chunky weight. One pair 4.5mm needles for the cuffs and size required for the shawl size that you wish to make. 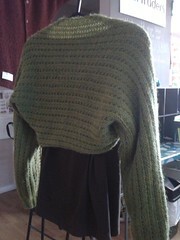 (see note above - this is a loosely knit garment). 1. With 4.5mm needles, cast on 30sts. 7. 2nd row: P5, *K2, P1. Repeat to last 2 sts, P2. 8. 4th row: P5, *K2, P1. Repeat from * to last 3 sts. Increase 1 in next st, P2. 9. Repeat these four rows, including the increased stitches into the pattern until there are a total of 65 sts (or whatever width you desire) ending with a Purl row. 10. Next row: Place a marker at the beginning of the row. Continue without shaping until the piece measures 30”(or length desired). Place a second marker along the same edge as the first. Measure the distance between the 1st and second markers and work the same distance without shaping until the length from the 2nd marker is the same as the first measurement, ending with a purl row. Place a 3rd marker. 11. 1st ptrn row: P5, *K2, P1. Repeat from * to last 4 sts. K2tog, P2. 12. 2nd and 4th row: Purl. 14. Repeat these 4 rows until there are 45 sts. 16. Repeat the cuff ribbing as described in #1-4. Cast off loosely. **Note: If you want a more fitted look, continue sewing the seam to the desired length. Perfect!!! Thank you.....I've got three grandsweeties/sisters to knit a shrug for and I think this is the one I'll make. After not knitting for 30 years, and dearly wanting a shrug, I found this pattern, started it last night and am almost 1/2 way done. Thank you for a perfectly comprehensible return to one of my favourite pastimes. I see gifts for my daughter, nieces, grand nieces and God daughter in the very near future. I made this for myself and my 97 year old Mother claimed it when she was hospitalized and hasn't given it back yet. She loves it!! I will definately be making more!